The Government is proposing to replace the current categories of School Action and School Action Plus with a new single early years and school-based SEN category. This will mean that your school of choice will have to comply with clear guidance from the Government on the appropriate identification of pupils with SEN. This guidance will include a clear process for identification and assessment of pupils, setting objectives for pupils, reviewing progress and securing further support. This will be set out in the new SEN Code of Practice - an indicative draft of the Code of Practice (COP) is already available. Take a look at the Code Of Practice, specifically Section 5.4 looks at Identifying Needs, 5.5 looks at The Four Primary Areas of SEN and 5.6 covers Additional SEN support in settings. Does your school consult with you? Do you know now if your child is School Action or School Action Plus? Did your school involve you in the decision to place (or remove) your child in this category? Do you think your school will admit that your child’s progress has been hampered by weak teaching? The Ofsted review of SEN (2010) found that nearly one fifth of the schools visited suggested that they provided additional SEN support when, in other schools, such provision was regarded as the norm. Therein lies a huge part of the problem. We all know there are schools where the staff will do all they absolutely can to ensure your child reaches their full potential and then there are schools which prefer to lay the lack of development at you and your child’s feet. I am very fortunate in that all three of my children are now in schools that take the former stance and not the latter. However, I do personally know of schools where there is not a chance in a million that they would ever admit they were perhaps the problem. Ofsted reports do not always reflect the true representation of SEN in schools – we all know of parents asked to keep their child home for the day Ofsted are arriving or their Ofsted questionnaire somehow not making it home. Would these schools be holding up their hands to say “oh sorry, some of our teaching is a bit weak”. The proposed removal of School Action and School Action Plus is part of the Children and Families Bill. After considering the Ofsted review of SEN (2012) and the Lamb Inquiry (2009), the Government believe the current system emphasises labelling children’s need according to the support needed rather than the outcomes sought for the child and can lead to children being unnecessarily labelled as having SEN. It also found that 'there is a risk that the use of the SEN label itself leads to lower expectations or less vigorous intervention. The Lamb Inquiry (20091) reported that SEN can sometimes be ‘unhelpfully collated’ with falling behind, and this may have contributed to the growing number of pupils at School Action and Action Plus. Did you know that at the end of Key Stage 2, August-born pupils are 60 per cent more likely to be identified as having SEN than September-born pupils? The Government believe that removing the need for a label of SEN, will challenge schools to improve the quality of teaching and learning for all pupils but what do you think? What about the very basic communication to families and practitioner of the proposed changes. If we can't get that right, how do we propose to get all of the changes right? Have you heard about the changes in your LA? Take our quick survey and let us know - we will be sharing the results with the Department for Education. There will always be great schools, management, LA Officers and staff (our Beacons of Good Practice) but there will also always be poor schools, management, LA officers and staff. As long as that fact does not change, then does it matter what they call the provision of additional SEN support in settings? What do you think? So true Steph. It’s also quite alarming how many parents don’t appear to know that this is coming. As a SENCO I’m concerned about the lack of information coming my way. I know the new CoP is not statutory until 2014 but it would be good to have guidance and time to prepare for the changes. I to am concerned about the ‘weak teaching’ aspect. How should I approach colleagues with this? 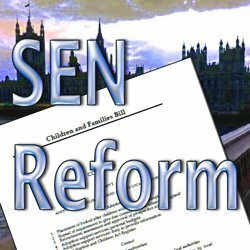 How easy will it be for children to be denied the support/provision they need if schools refuse to diagnose or seek diagnosis of an identified SEN? Budgets are so tight already and don’t get me started on Academies!!! I went to a conference early on when the Green paper was published. We all agreed it set many challenges but offered few solutions, so far nothing seems to have changed. I am very concerned as a SENCO for my pupils and their families. I like the idea of it being outcome based for the child. This COULD be a better focus for everyone…if, as you’ve said, the Schools are doing their bit properly. As we probably all know, some will and some won’t. In my experience (2 children with sen, 1 with a statement, 1 being assessed at the moment) the main problem seems to be with the LEA. And i don’t see anything in the proposals that will change the way they operate. They do not seem to listen to schools or parents, do not turn up to important reviews, and i have found them to be less than honest. What recommendations do people have for addressing the issues of poor school, management, LEA, LA officers etc? Debs as a SENCO I’ve found it beneficial when dealing with the LEA for the school and parents to be united as a team in support of pupil/their child. I know not all schools work well with parents but I’ve watched the LEA roll over when they realise the school are standing firm with the parents. The local Parent Partnership team has been hugely helpful too. Strength in numbers I would say.